When I was diagnosed with Hashimoto’s in 2009, after almost a decade of some really frustrating symptoms, including fatigue, anxiety, carpal tunnel, hair loss, weight gain and palpitations, I was relieved. I finally had a name for the seemingly unrelated symptoms that were plaguing me. 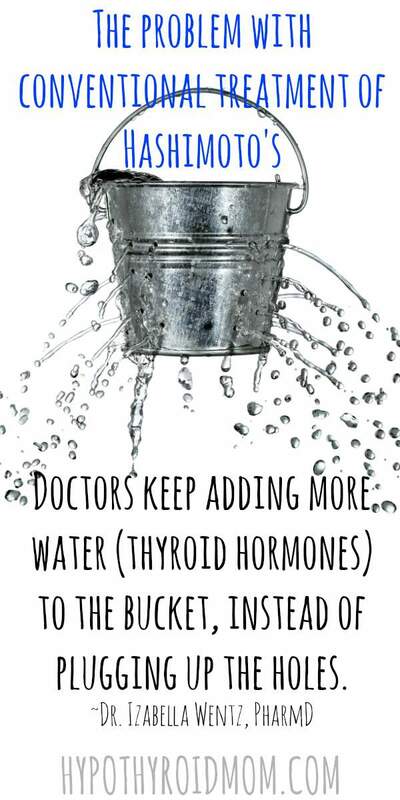 I was excited that I would be able to start thyroid hormones to help myself, but was disappointed when I only saw a slight improvement in my many symptoms. I was also frustrated by the fact that the only treatment recommended was a synthetic medication to replace the hormone my thyroid gland was no longer making because of an autoimmune attack, but there was no recommendation to address the attack on my thyroid gland! It felt like I had a bucket with holes, and everyone just kept telling me to add more water to the bucket, instead of plugging up the holes. I wanted to know if there was anything I could to to feel better, and to perhaps slow down or stop the attack on my thyroid gland. I started researching lifestyle interventions that might help with the many Hashimoto’s symptoms I had, some of which I had been dealing with for nearly a decade. As a pharmacist, I wasn’t approaching this from an anti-medication position—rather, I thought that there had to be more that I could do to help myself. I had been taught that in chronic conditions, lifestyle interventions should always be considered before or alongside medications, yet there were no lifestyle recommendations made for Hashimoto’s, or any other autoimmune condition. My diagnosis prompted a passionate search for solutions based around the idea that Hashimoto’s is an autoimmune disease, specifically the immune system’s attack on the thyroid. I wanted to get to the Why of the attack—what was the root cause underlying the internal war being waged against my tiny, but vital butterfly-shaped organ? And could addressing these root causes improve my symptoms, even put the condition in remission? I was a highly motivated solution seeker. I was struggling with irritable bowel syndrome, chronic cough, multiple allergies, chronic fatigue, hair loss, carpal tunnel, frustrating memory issues, acid reflux, joint pain, skin issues, cold intolerance, panic attacks, and more. I was young and in love and living in Los Angeles with a promising career, yet my lack of energy and health left me feeling like I was missing out on all of it. Ultimately, addressing the underlying root causes of my Hashimoto’s condition required strategic supplements and dietary changes, and identifying triggers within my own environment and body that led me to develop the condition. My symptoms didn’t disappear overnight, but I saw gradual improvements as I progressively incorporated different and additional interventions. My digestion began to improve first– IBS, acid reflux, and bloating—disappeared after I made dietary adjustments. Then my energy and memory started to show improvements, and my muscle pains subsided. Finally, my hair stopped shedding, and eventually grew back! The whole journey from my first change in January 2011, to my eventual remission in January 2013, took a little over two years! Throughout this process, I kept a detailed journal, which I eventually turned that into a book called Hashimoto’s Thyroiditis: Lifestyle Interventions for Finding and Treating the Root Cause. The response to the book was so positive that it became clear to me how many other women were looking for an empowering, proactive approach to Hashimoto’s. These women, who I began to call my Root Cause Rebels, were also opposed to simply standing by as their bodies were breaking apart and wanted to take an active role in their healing—I helped them discover that we have so much more power over our own health than we realize. I began taking on clients and developing workshops to guide women through their own recovery from Hashimoto’s. The work was so exciting and my approach only continued to evolve as I delved further into the research on Hashimoto’s and adjusted protocols based on client results. One of the most profound adjustments I made was where to start in the approach to healing. I used to begin by addressing the most obvious root causes and imbalances, but that wasn’t efficient for everybody. Some of my clients even had adverse reactions to some of the benign supplements I would recommend! In doing a little more research, I came to realize that adverse reactions to supplements are often due to improper liver breakdown of the supplements. I started these clients on a liver support protocol. I was blown away by the results. I used to address the most obvious root causes and imbalances first, but this seemed to take a long time—I wanted the healing to happen faster, and so did my clients. For most of the women I was working with, targeted liver support provided this accelerated recovery, helping them feel better within just a few weeks. Joint pains, rashes, hormonal imbalances, chemical sensitivities, fatigue, mood swings, and brain fog all began to improve is as little as 14 days. Here’s why I had a hunch about the liver: your liver is your primary detoxification organ, and people with Hashimoto’s are prone to having impaired detoxification abilities. This could be caused or exacerbated by nutrient deficiencies (perpetuated by a permeable gut), the presence of the MTHFR gene mutation, which compromises methylation, excessive toxin exposure, and/or a slowed clearance of sweat. Whatever the cause, when your liver gets congested it can lead to ineffective utilization of thyroid medications and supplements, as well as an ever-increasing buildup of toxins, all of these can lead to worsening symptoms and even new symptoms altogether. A congested liver might contribute to skin breakouts, supplement or medication sensitivity, relentless fatigue, digestive issues, multiple sensitivities, and more. In my work with clients and in my new book Hashimoto’s Protocol: A 90-Day Plan for Reversing Thyroid Symptoms and Getting Your Life Back , I use targeted assessments to help identify each individual’s starting point. The questionnaires address three core areas: the liver, the adrenal glands, and the gut, then get deeper into areas of nutrition, traumatic stress, infections, and more in unresolved or advanced cases. What the answers reveal is what your trigger or triggers might be and where to direct your greatest level of focus. My book released on March 28, 2017 and within 9 days it became a #1 New York Times Bestseller! For authors this is like winning the Olympics in writing and I am so humbled to receive this honor. Even though these assessments allow for a certain degree of customization in each person’s approach to healing from Hashimoto’s, I still advise that everyone start with supporting their liver. If our first goal is to feel better, beginning with the liver has proven again and again to help achieve that faster and more effectively than any other approach. There’s one primary reason starting with the liver makes sense: no matter who you are, your liver has to work harder today than ever before. There are toxins in the air we breathe, both indoors and outdoors, the food we eat, the beverages we drink, the makeup and lotions we apply to our skin, the cleaning products we use in our homes… (I could go on, but I don’t want to scare you!) Let’s just say that as the boss of the body’s detoxification system, the liver is working overtime all the time these days. And if you’re dealing with an autoimmune condition, you’re more prone to developing a backup or breakdown of this system. My approach to supporting the liver includes an analysis of your daily toxic exposure and a plan for reducing it. Are you living in a home with mold? Using lip gloss loaded with arsenic (I was and it led to a return of many of my symptoms)? Buying produce coated in pesticide residue? Drinking water full of fluoride? We take for granted that what we put into and onto our bodies is safe, but an informed look around you can often reveal otherwise. Let’s a take a deeper look at each of these steps. If you have Hashimoto’s, you are more likely to have sensitivities to specific foods and to substances that may be found on or in foods. This means you might react to: food proteins, such as those found in gluten, dairy, and soy, which are notoriously difficult to digest; pesticide residue found on produce; or to elements like mercury, to which you’re exposed at higher levels when you eat certain types of fish, especially swordfish and certain types of tuna. A toxic reaction to food proteins can occur in two forms: as a food sensitivity or a food allergy. A sensitivity will trigger symptoms such as irritable bowel symptoms, skin breakouts, or headaches and can take up to four days to manifest. An allergy will be noticeable immediately and produce much more severe symptoms. Hashimoto’s and food sensitivities often co-occur, and in my experience with clients, the majority (88 percent) will have a reduction in thyroid symptoms and antibodies after removing triggering food proteins. Because of gluten’s ability to cause intestinal damage (specifically leaky gut), it’s the food protein most likely to cause problems for those with Hashimoto’s and other autoimmune diseases. In some cases, the removal of gluten alone can produce profound improvements in thyroid symptoms. My clients have reported hair regrowth, the lowering of antibodies to normal range, a reduction in medication, an elimination of digestive issues…the list goes on. It’s not the cure all for everyone, but it’s proven to be the cure for some. During this first step of the Liver Support Protocol, I advise clients and readers to cut out gluten, dairy, sugar, soy, caffeine, and alcohol. Just as much as some foods can be toxic to your body, others can be healing and restorative—true tonics to your cells and tissues. In my book, I highlight eleven superfoods that will provide gentle support to stomach and liver detoxification pathways and have both anti-inflammatory and antioxidant qualities. This list includes hot lemon water, my green smoothie which is a delicious and nourishing combo of hypoallergenic pea protein, coconut milk, and some of my favorite veggies—beets, cilantro, berries, fermented foods, cruciferous veggies, turmeric, and more. I’ve worked hard over the years to ensure that this list is the most impactful it can be, and to create recipes that make you feel like you’re not missing out on anything. Clients love the Fermented Margarita and Virgin Mojito and the simple slow cooker Tandoori Chicken, to name a few. The powerful two-step start of the Liver Support Protocol can start to transform how you feel in as little as a few days. Implementing one without the other will limit the improvements you’ll experience so I always advise the two be done simultaneously. My focus in this step is reducing your daily toxic burden by pointing out places in your home where toxic substances can hide. Whether you’re aware of it or not, this includes your kitchen, your medicine cabinet, your faucet, your air vents, and your makeup drawer. I’ve spent a lot of time researching the best types of pots and pans, food storage containers, water filters, houseplants (for home air purification), and personal care items such as shampoos, lotions, makeup, deodorants, and perfumes. While the toxic exposure from these household items might seem limited, collectively they can contribute to a substantial toxic load—especially when you consider these are items you use, apply, inhale, or ingest every single day, in some cases multiple times a day. Strategic activities and supplements can further boost detoxification during the Liver Support Protocol. One of the simplest ways to encourage your liver to push through a toxic backlog is to break a sweat. If you have hypothyroidism due to Hashimoto’s, you might have to push a bit harder to make yourself sweat. I love hot yoga for this purpose, but saunas, hot baths, and a tough workout of your preferred type of exercise can do the trick. I have found that certain supplements can help decongest the two main pathways your liver uses for detox. Some of these detox helpers (such as Milk Thistle , which you might have heard of) assist the liver with clearing toxins found in bile and minimize toxic substances present in the body. I know that dealing with symptoms caused by Hashimoto’s can be frustrating and debilitating and leave you feeling helpless. But I’ve discovered, with my own health and with the health of my clients, that there is action that can be taken to get you on the path to healing. And in my experience, nothing has produced more profound improvements than careful, liver-focused care. When the liver is detoxing properly, your thyroid medications become more effective, symptoms of toxic build up, such as skin breakouts, fatigue, pain and memory issues, lessen, and nutrients are better absorbed. While the Liver Support Protocol is recommended for two weeks, I’ve had clients experience noticeable improvements in just seven days. 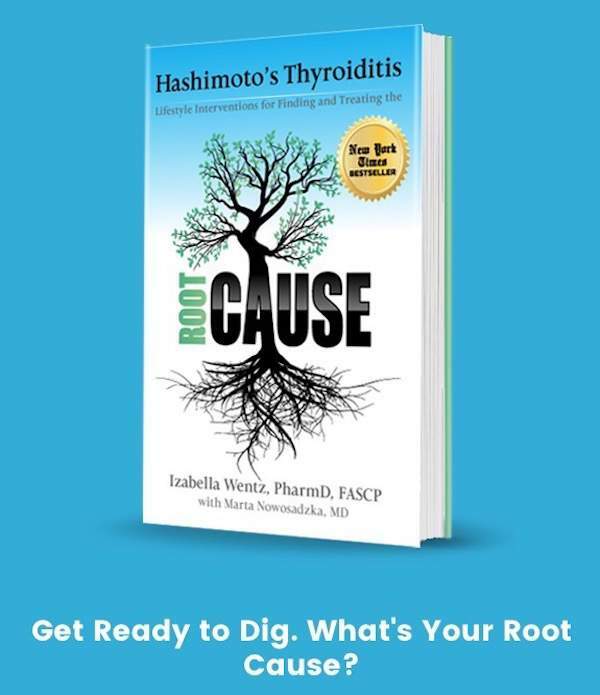 Dr. Izabella Wentz is an internationally acclaimed thyroid specialist and licensed pharmacist who has dedicated her career to addressing the root causes of autoimmune thyroid disease after being diagnosed with Hashimoto’s thyroiditis in 2009. 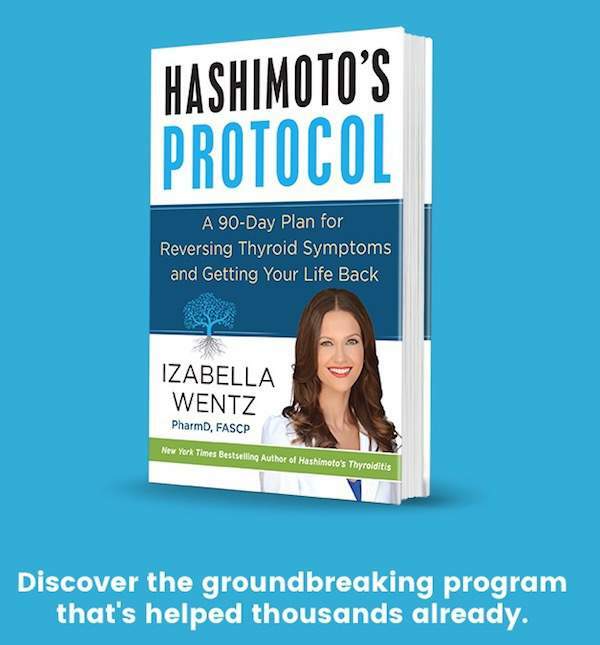 Dr. Wentz is the author of the New York Times best-selling patient guide Hashimoto’s Thyroiditis: Lifestyle Interventions for Finding and Treating the Root Cause and the protocol-based book Hashimoto’s Protocol: A 90-Day Plan for Reversing Thyroid Symptoms and Getting Your Life Back. Thank you so much for putting this information out on Pinterest! We are buying this book. My daughter took a medication for acne called minocycline and had a severe reaction ultimately leading to Hashimoto’s along with several other issues but Hashimoto’s wasn’t going away as the other issues did with discontinuation of the med and only gaining momentum. The particular medication metabolizes through the liver and was just more than her fourteen year old body could handle. This makes a lot of sense now and hopefully we can get her back to normal. She’s seventeen now and would like to feel well again before going off to college. Thank you! Getting a Hypothyroidism diagnosis was a very long road for me. After a year of suffering and, eventually, depression, had my dermatologist/general practitioner refer me to an allergist who gave me a list of products I could use that didn’t contain things I was allergic to. I cut out refined sugar as well as gluten, lost 26 pounds and most of my symptoms. Red wine turned out to be a big offender. Going all organic and as natural as possible with my diet, cleaning products, makeup, toothpaste, you name it, is key. I love the detox idea for fast results. Man, I wish I could have found this article sooner! In my case, my liver was acting up a year before I was diagnosed with Hashimoto’s. I had extremely high bilirubin levels that led to uncontrollable scratching, & cronic diarrhea. I had a biopsy that did not give any answers to why this happened. Then I got better on my own. Fast forward to my thyroid diagnosis which came after a tachycardia episode. I was told a thyroid storm caused the tachycardia. Everyone keeps saying you’ll feel better when they get your meds right, but I’m still waiting for that.. It makes sense to me that my liver may be the root. I’m going to do my best to change some things. Do these diet and life styles give good results for men with hashimotos? 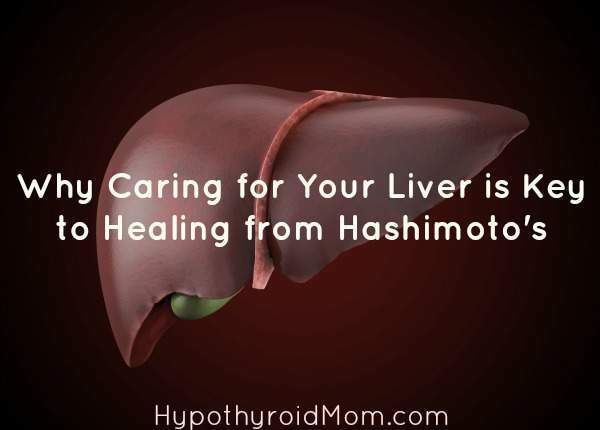 Hi RD, Yes the liver is key to Hashimoto’s in women and men, as well as children. Good to have you at Hypothyroid Mom. I have read many articles that state the Milk Thistle should not be used when a person has Hashimoto’s or Celiac and I have both. Please, what is your thought regarding this matter?